A friend once said to me that all religions are by nature conservative and so are people who take religion seriously because religion exists to bring something from the more or less distant past forward into the future. G. K. Chesterton said that “the Catholic Church is the only thing which saves a man from the degrading slavery of being a child of his age” and that orthodoxy is the “democracy of the dead.” Such is my sympathy with these declarations that I can assure you that if someone presents with me a book and recommends it with the adjective “revolutionary,” I am at least suspicious if not outright ill-disposed toward it from the beginning. But that is now exactly what I am going to do. I am going to recommend to you a book that I can only describe as revolutionary because it really changed the way I look at some things that are going on within the Church. The book is Living the Call: An Introduction to the Lay Vocation by Michael Novak and William E. Simon, Jr. and it happily takes us beyond several of the contentions between conservative and progressive Catholics to demonstrate that while we have been arguing, the Church has been moving in ways we perhaps did not even notice. This relatively steady drop in the ranks of the nation’s priests has been almost exactly compensated for by the steady increase in the number of laypersons performing the many, many functional tasks around active parishes. The ever-growing numbers and types of ministries — the outreach that is required these days — can now be taken care of by laypeople instead of exhausting the energies of too few priests. In certain ways, the Church may be more active ministerially than ever (emphasis mine). The book then goes on to tell the stories of nine Catholic lay people who are living the call, including in such fields as pastoral duties, education, and caring for the poor. Here is where I found myself most challenged in reading Living the Call. I admit to an initial resistance to the concept of lay people in pastoral roles and to be completely frank, especially the concept of women in pastoral roles. As I read this book, I had to ask myself why I had this antipathy. Seeing lay people in pastoral roles — excluding of course those sacramental ministries needing a priest — had long been for me a sign of something missing, as though the lay person was a warning cone over a pothole showing that something here has given way and is unsafe. The lay person was, after all, “filling in” for a “missing” priest, right? Well, the Church is saying, no, that is wrong; the lay person in pastoral ministry is not a mere temporary fill-in for a missing priest, a band-aid over a situation we are hoping to heal, rather these lay people are answering a call from God — based on their baptism and confirmation, validated by the Church through discernment and subsequent formation — to serve the people of God in a role that is properly theirs. Here is the Church, which taught me about the essential maleness of the priesthood and spiritual fatherhood, placing women in pastoral roles. These are roles of real leadership and care for souls albeit properly subject to bishops and in cooperation with and sometimes under direction of priests. I had to confront that my distaste for the idea of women in pastoral roles came from years and years of encountering radical feminism with its ridiculous insistence on women priests. But this was not that! I asked myself, would I be put out if I went to a parish that did not have full-time priest — perhaps only visited by a priest on the weekend for Confession and Mass — but was cared for pastorally all the rest of the week by the Blessed Virgin Mary? Well… NO! It isn’t feminine leadership in and of itself that revolted me; it was the distortion of that leadership by radical feminists and the real demonic ugliness of their approach that had wreathed women who sought leadership roles in the Church in a cloud of suspicion that women leaders “really wanted” to be priests and saw themselves as some kind of vanguard in a movement to get the Church to accept women priests. But the Church was not suspicious. Given proper formation, women by the thousands are stepping into leadership roles in the Church, placing at the service of God’s people their feminine genius — a particular sensitivity to the needs of the human person — and filling pastoral roles. Having touched on this issue of formation a couple of times, I should mention that a good portion of Living the Call is devoted to how the Church is forming lay people for service. And this too was a real revolution in my thinking. I am used parish volunteerism — and the authors acknowledge its importance, both now and into the future. But what the book opened my eyes to is that the Church desires for more lay people to make their call to serve into their profession and desires to equip them through education to do just that. Living the Call catalogs a dizzying array of volunteer and professional opportunities and a rich smorgasbord of educational and formative offerings with more coming online (both literally and figuratively) all the time. In the past 30 years, lay association with religious communities has grown dramatically and evolved into myriad forms quite different from those of the centuries-old traditions. According to the latest official study conducted by the North American Conference of Associates and Religious (NACAR), in 2002, there were more than 27,000 lay associates in the United States. NACAR estimates that today, this number is in the range of 35,000 to 40,000. These new programs of lay association are of an astonishing reach and variety. But they do share a few characteristics. They are not officially recognized by Rome, and they entail no strict rules for daily life or obligations of membership, financial or otherwise. In some cases, associates support their religious communities only through their union with them in prayer; in others, associates are active participants in community functions and ministries. Most lay associates today are women, but a host of communities of male religious also have associate programs. “Gender mixing” is also an interesting feature of many programs. Most men opt to affiliate with men’s orders and women with women’s, but in some cases, men’s orders are open to women as associates, and women’s orders to men. If every practicing Catholic in America, attending Mass on Sunday, were to make up a list of just three family members or friends who are lapsed Catholics and manage by positive efforts over a year or two to bring them back to the Body and Blood, the active Church in America would grow from 18 million to 72 million. If, during the next five years, these 72 million each felt the inner impulsion of the fiery life of the Trinity within them and directed its radiance outward into the minds of one other American whom God sends their way, the love of Christ might then nourish 144 million souls, one in unity with all the ages and ages of martyrs, saints and holy ones since the beginning. If this outreach were repeated during the next five years, the number of Catholics in America would grow to 288 million. The lay vocation is to change the world. That is, to inflame it with more of God’s humble love, considerate and noticing love. Moreover, experience shows that quiet intensity matters. If you allow God’s caritas to flood through you, as He longs for it to do, that adds eternal, divine significance to the tiny deeds you do. It gives them 10 times, a hundred times, a million times more divine power. For it is no longer you who love but God loving in you. And He rejoices to work through the humble, small things of this world far more than the grand. That is why He chooses you. It is a revolutionary prescription and the medicine our world needs. 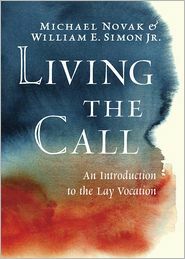 Highly recommended: Living the Call: An Introduction to the Lay Vocation.